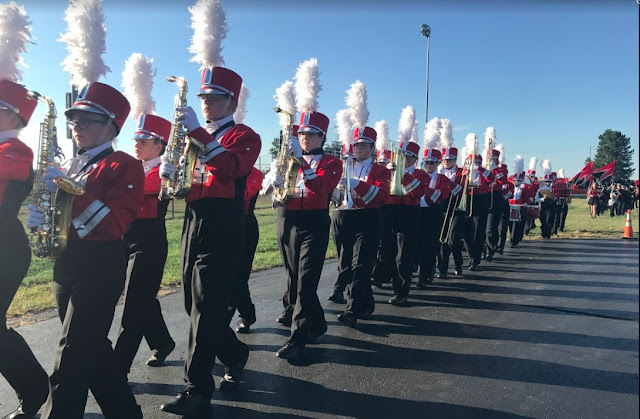 So I figured up everything that we need to accomplish this week for FES/Circleville, and the away game at Marion Catholic, and found out that we simply don't need FOUR HOURS of rehearsal to accomplish all of this. This being said, I'm canceling Monday's after school rehearsal. Please spread the word to your non-internet type FMB friends. I'll also have it on Monday morning's announcements. Go home. Rest. Do homework. Watch some TV. Be a teenager. Wednesday's rehearsal will run the full time 3:15 to 5:15 so we can do all our weekend prep AND have our end-of-the-year festivities. did u video tape last fridays pregame? ..... if so did u post it on your blog???? just wondering i wanted to c wat we looked like!